Hyundai is a great brand of vehicles. You get an extremely affordable and reliable vehicle, but vehicles like the Veloster come with great performance features. This year's Veloster comes with a standard 2.0 Liter, 275 horsepower, In-Line 4 engine. A 6 speed transmission is standard as well as front wheel drive. You can upgrade these options to add some more power under the hood, but most consumers find this is an adequate amount of power for a vehicle of this type. 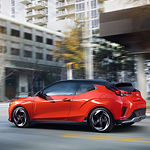 The combined fuel efficiency ratings for the 2019 Hyundai Veloster is about 30 miles per gallon for both city and highway combined. You'll spend less than $1500 per year on fuel costs. Hyundai has always been known for manufacturing incredibly efficient vehicles. The Veloster definitely is efficient, but the amount of power it has is quite impressive.